After hacking and showing their power to save the freedom of Internet Anonymous has planned peaceful street demonstrations in Mumbai, Delhi, Bangalore, Kolkata, Pune, Kochi and other cities on June 9. The demands include removal of blocks on websites and for amendment of certain provisions in the IT Act 2008. The group has requested all protestors to wear Guy Fawkes masks, the symbol of Anonymous. "We are against internet censorship. Instead of blocking few URLs, the ISP blocked the whole domain of various file-sharing websites. 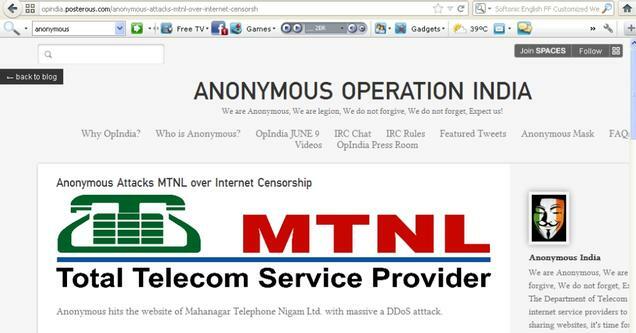 The (Madras) HC, DoT didn't issue any list of websites to be blocked, still ISP supported internet censorship." internet service providers (ISPs) such as Airtel and Reliance Communications blocked a number of video-sharing and file-sharing sites, including Vimeo, DailyMotion.com, Isohunt.com, thepiratebay.org, torrentz.eu, kat.ph and pastebin.com.